Wellness Wednesday Tip #53: Your Plate Size Could Matter! Happy Wellfie Wednesday Folks! Thanks for joining us! This week’s tip is quick and easy. Your Plate Size Could Matter! Have you ever thought that the plate you’re eating off could be contributing to the amount of food you eat? If it hasn’t affected you, it surely has affected me. 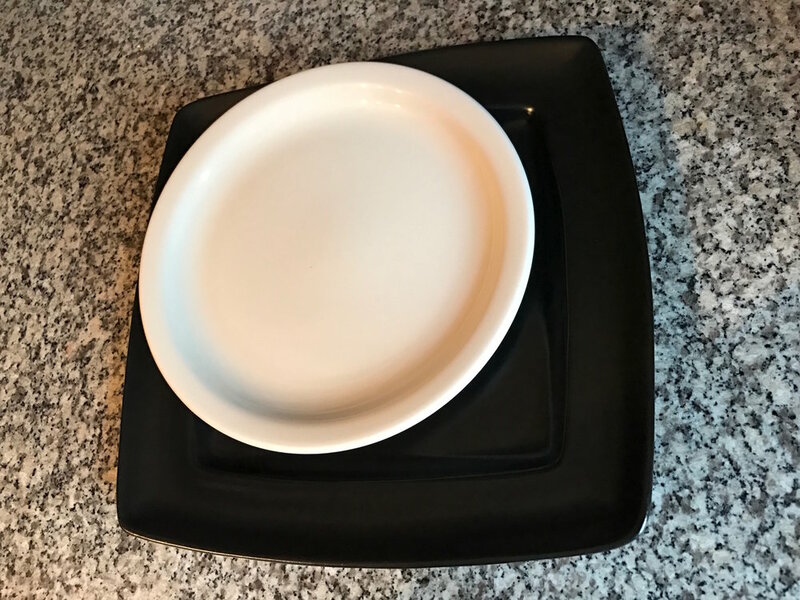 I remember when I first started college, moving into my own place, I for some reason wanted square plates, I thought they were cool looking, so I bought a set. The entrée plates were huge! And boy did I fill them up. Not saying it solely contributed the amount of weight I packed on during college, but I’m certain it played a role. Lately however, we’ve been using these smaller round plates, and it’s obvious that the food portions have been cut down. So what’s the point of this. For an odd reason, some of us have grown up with the notion of cleaning the plate, leaving nothing behind, eating it all regardless of feeling full. Which I, like most people I know, live by this. If your trying to cut back on portion sizes, changing your plate size could potentially help, if a calorie adjustment is what you’re looking for. Though, I think the more interesting gain from altering your plate size comes from swapping your entrée and salad plate. We traditionally load up our entrée plate with proteins and starches, throwing the highly important greens on a surface area of near nothing. Think about swapping those, loading up on your veggies instead, because there is surely nothing wrong with more plants. If you don’t end up making a plate swap, that’s fine, but try being more mindful about your plate size. Thanks for the support! And be sure to tag the WW crew members in your post (@PBernerSPT, @Eric_in_AmERICa, @AaronPerezPT, @DianaKlatt) and keep the wave of healthy change going!